Eisco Labs Chicken / Hen Anatomy model- 6 Parts. The life-sized, six-part, cross sectional hen. The life-sized, six-part, cross sectional hen model depicts the female bird in very high detail, allowing students to remove the internal organs, and muscular system and closely examine both the internal and external anatomical features. Left side shows internal structures of digestive, resp and circulatory system, as well as a fully developed egg. This portion of the model can be removed to show the muscular structure of the right hand side, as well as a removable wing. Model is 17" H x 16" L x 5" W on a 10"x 7 base. Key card with 53 call outs is included. We strive to satisfy absolutely every customer. 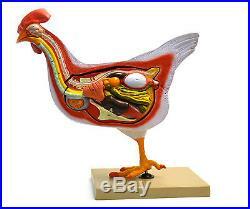 The item "Chicken / Hen Anatomy model- 6 Parts" is in sale since Friday, January 29, 2016. This item is in the category "Business & Industrial\Healthcare, Lab & Life Science\Lab Supplies\Other Lab Supplies". The seller is "hbarsci" and is located in Rochester, New York.